For years people have been singing the praise of the yellow South Asian spice called turmeric. Many studies have been done on its health benefits which include anticancer properties, tumor fight activities and it’s a potent anti-inflammatory food. The polyphenol in turmeric is called curcumin. 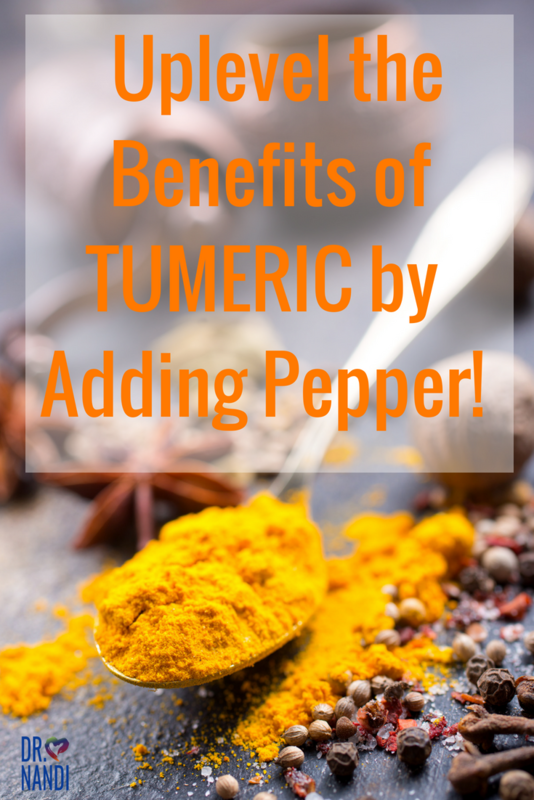 Science has known for many years that turmeric on its own has a very low bioavailability but that can all change when you combine turmeric with black pepper. Nutritionists have discovered that adding turmeric and black pepper together, you can increase the curcumin bio-availability by at least 1,000 times. The piperine which is an alkaloid responsible for the pungency of black pepper and long pepper assists the curcumin to be absorbed much more efficiently by the body. Why black pepper and turmeric? Taking turmeric with black pepper may boost its bioavailability up to an astonishing 2000%. The piperine found in black pepper acts as an excellent bio-enhancer. It can improve the bioavailability of other substances in the body. Black pepper is a condiment, which is made from a fruit known as the peppercorn. Once peppercorn attains full size, they are picked and allowed to dry under the sunlight. Once picked, the peppercorns are left until they become shriveled and turn black. The enzymes present in berries turn the skin of peppercorn black in the drying process. What are the health benefits of black pepper? Black pepper has been found to improves digestion. Studies suggest diets with black pepper can help with weight loss, provide respiratory relief. Black pepper is known to enhance bioavailability and enhance cognitive function. Other benefits include antioxidant and antibacterial qualities. Can black pepper upset your stomach? Black pepper may upset the stomach or cause gastrointestinal problems. Some doctors suggest that people suffering from gastrointestinal disorders should avoid taking black pepper. For some people, consuming too much black pepper can cause a temporary burning sensation in the stomach. This sensation will go away with time. Can black pepper lower blood pressure? Preliminary research suggests that black pepper may lower cholesterol and blood pressure levels. Researchers believe the compound piperine may play a significant role in reducing blood pressure. Is freshly ground black pepper healthier? Research suggests that freshly ground black pepper is healthier because it hasn’t oxidized or lost its potency. Ground black pepper has a recommended shelf life of 2-3 years as opposed to the 5-6 year shelf life of whole black peppercorns. Where is turmeric native to? This perennial plant was originally native to India and cultivated in Southeast Asia. If you would like to grow your own turmeric plant, it can be done quite easily. Recent studies have looked at the active ingredient, curcumin found in turmeric. Early results suggest that it was effective at increasing weight loss and reducing fat among overweight subjects. The study also found that turmeric helped to reduce their waistlines and hip circumferences. These promising results are still needing to be verified. Curcumin is the component of turmeric that gives the spice its bright yellow color. It is too early to say “yes,” but studies are suggesting that turmeric may help prevent some types of cancers. Some studies have shown that curcumin may help to prevent several forms of cancer including breast, lung, stomach, liver, and colon because of its anti-inflammatory and antioxidant properties. It may stop the development of cancer by interfering with the cellular signaling aspects of the chronic disease. Milk and turmeric are antioxidants. Turmeric milk helps fight free radicals that damage skin and make it lose its glow and elasticity. Turmeric milk can treat diarrhea and indigestion, but low-fat milk is best for this situation. Is turmeric good for animals? Many vets are now recommending turmeric for animals to help control inflammation and pain in itchy skin conditions like allergy, atopy, arthritis, infections, age degeneration and various cancers. Vets suggest not using turmeric pills but the actual powder to ensure the proper dose of curcumin. Fish Curry Powder – Use this fish curry powder on your favorite fish. Turmeric & Black Pepper Paste – Add this paste to plain yogurt, make your own Golden Milk Smoothies, or add it to your favorite sauteed veggies or dinner dishes.